I’m looking into buying a Mac Pro but with only about £300 to spare I can only really get a 1.1 but I want to be able to run MV or at least ML and after scanning the web I have to say this has to be the best and easiest way of installing MV on an original Mac Pro! The others aren’t that hard either but this has to be the easiest because it’s a script with a good UI. One concern I have before I go and splash out £300 is whether MV will run well on a 1.1?! Has anyone done this who can tell me what it’s like because if it’s really laggy and uses up all your processing and graphical power then I don’t think it’s worth it! Cheers in advance! 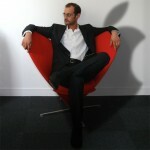 I would say that i should go well with no much trouble, but you should follow threads on Mac rumors. The only big concern would be the Graphic card but now there are cheap one from the PC world that goes well. Personnaly I’ve tested on a Macpro1,1 with a default 7300 and Screen is ok, but not accelerated; I have to admit that my main concern is the coding challenge for itself. This macPro is quite not used here at work and I don’t go much on it. SO get a cheap PC card and you should not have trouble as many have done it. I currently don’t have Macrumors or xlr8yourmac urls at hand but google will definitly give you hints. Another thing is for sure, if the MacPro1,1 I’m using for test was mine and @ home, I definitly would install Mavericks on it (well it has Mavericks yet as it is the guinea pig) and search for a PC card. my best and Happy New Year. Hi i have Macpro 1,1 !! would you tell me please how can i install OSX Mavericks ?? and with this app i can,t find the Password , where is the Password for Administator ? is any Youtube link ?? that i can see how is working ?? Thanks so much for this great tool. I successfully updated my Macpro 2,1 (with upgraded graphics card) using SFOTT to a clean SSD. It’s running great – very quick and responsive. I was wondering if anyone else out there is struggling to get location services working under Mavericks on 2006 Macpros? I have wifi enabled (using an original factory installed card) and my router is an apple time machine so assume the hardware should be supported. Any similar experiences? Also I don’t seem to gave a recovery partition – any tips on setting one up? I’m late on this but i’m working on the Recovery Partition stuff. This will get you Location Services to work then. Stay tuned. Hi, I have tried to install both Mavericks and Mountain Lion on my iMac 5,1 with Lion, but I could not get past this message “To download and restore OS X, your computer’s eligibility will be verified with Apple.” I pressed enter and am stuck with “Could not find installation information for this machine.” Judging from the comments above, it seems to work mostly for Mac Pros. Will you be able to verify this so that I can give up trying? Thanks! I can’t verify with iMacs as I don’t have one at hand at all. I also can’t tell for sure if it could work or not, I really don’t know. I’ve got a client that has some iMacs so I’ll check and see if the are supoorted or not and if not I’ll give a try with the key and install, but I’m not schedule to go there until next month, and they are production computers so I won’t play much with them, but I’ll give a try for sure. Sooner if I can pass by the office before next schedule. Sorry I can’t help more, MacRumors should be the best place to search for infos on that. Thanks for your help. That’s handy to know. I’m just glad that other users of Macpros are able to keep working on their old machines with the new os. Just trying to hold on dearly to mine ;) Cheers. As soon as I’ve tested on iMacs, I’ll tell if it worked in here. That’ll be much appreciated. Many thanks. However, when I launch Install OS X Mavericks.app I still get “OS X Mavericks cannot be installed on this computer”. Couple questions; Should the installer still be in the Applications folder? (The modified date shows the downloaded date – ie. wasn’t updated after running the Sfott script) Also, the USB thumbdrive was renamed SFOTT but doesn’t appear to have anything but an Applications folder with Safari.app and a few Utilities and Sfott folder within it. Maybe the setup wasn’t really properly installed? It seems you’re launching the installer directly from the key on your current System. — You have to boot from the key to get things work – aka booting with tiamo’s boot.efi (on the key) then using the (pacthed) installer should go fine. 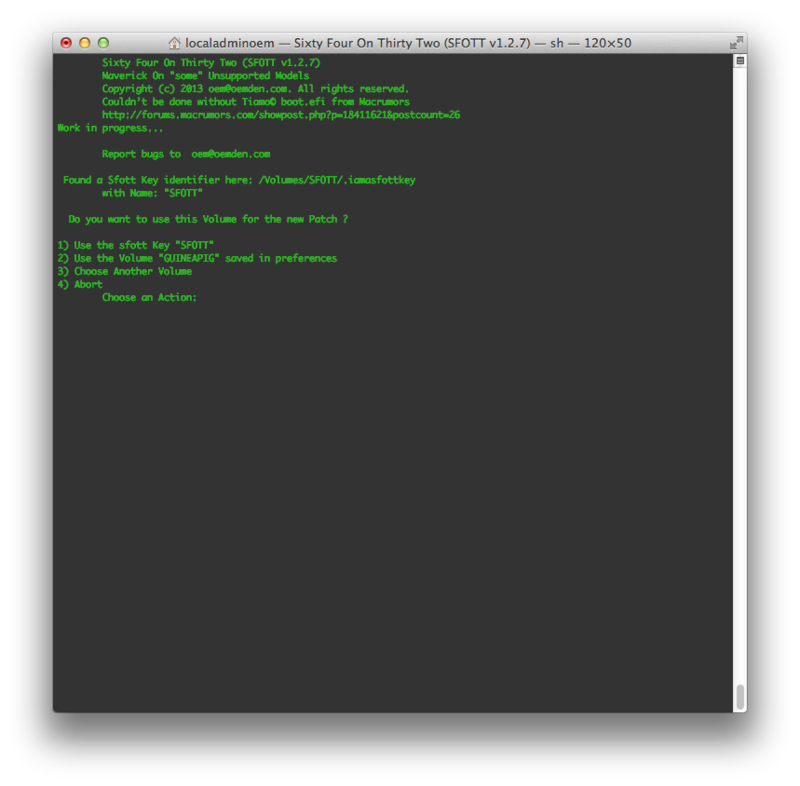 MacPro is definitely one of the easiest to go with this “trick” of Tiamo’s boot.efi. 2) to boot from the Key just hold on the “option-alt” key at boot, then the key will show up, and you’ll be able to choose it. 4) before trying to Upgrade to Mavericks on a System please be absolutely sure to have Backups, Clone or both as “usual” when updating/upgrading a system. you are playing with your datas remember it. Best practice is to do a fresh install, at least the first time on another drive or partition. If all is ok, then you can attempt an upgrade on your current system. If you install on another drive/partition, you can also use the Migration assistant that will show up. if you read comments in here you’ll see that I really insist on this, either with supported or unsupported Macs – in our case. Now that I’ve warned – a bit :) – on basic stuff concerning your datas and systems, Some did indeed install on an existing System without fresh installs with no glitches at all. So considering you’ve backuped everything you can boot from the key and install Mavericks on your Macpro1,1 and enjoy it. if you want to upgrade your system then – I guess – you’ll have a recovery partition (the one from Lion) but I’m not sure of that. if you do a fresh install you won’t have the recovery partition. you’ll have to use others utility to do so. It will be on the Sfott utility that’s for sure, I still didn’t choose if I’ll make a second utility or include it with scott script. Anyway you should be good to go. I hope I was clear enough and I did not wrote too much. After cloning my startup disk, I restarted and selected the thumb drive with the key but all I get is the apple logo startup and the spinner…going on 15+ minutes now. I’ll note that I had Mountain Lion running on my Mac Pro 1,1 using the Chameleon method – perhaps this is muddying the processes? Maybe Chameleon mess things up, I really could not tell. I did not gave a shot to Chameleon I have to admit. I would try to reset the PRAM (command option P R ) then boot directly from the stick and see if it goes well. That’s what I did the first time when testing on the the MacPro1,1. and before that I would take out the Chameleon drive (and any drive that matters to avoid trouble with datas – you know how I am with backups) anyway I would only have the target disc for the System. if you have a Lion System at hand I would also boot on it first to eventually be sure Chameleon isn’t playing with the install – after take out the Chameleon drive). then I would reboot, reset the PRAM and then choose the Key and give a shot. of course if it goes well put the discs back in place to get your datas…. Thanks so much for pulling this together and especially for your active support. I have successfully installed Mavericks on my MacPro1,1 going with an internal hard drive (same as the Chameleon approach with Mountain Lion). What I love about this solution, I don’t have to hold down option when I reboot and as a nice surprise, iCloud and Messages works again! I figure I now have at least another year or two of production out of my aging but very capable MacPro. Many thanks, to you and Tiamo! After rebooting from the created usb key… any estimate as to how long a typical install would take? I’ve been looking at a gray screen with the spinning gear in the middle of the screen for over an hour… starting to wonder if I did something wrong but don’t want to kill it if nothing is wrong and it just takes a long time… I’m updating a Mac 1,1 to Mavericks… thanks so much for all the work… even if this doesn’t work!! you should not have to wait that much that’s for sure. Some have had trouble with USB keys. Can you try with an internal disc or partition or a FW disk. Also the installer should be obtained directly from the Appstore rather than hmmm someplace somewhere..
Also the video card could be troublesome but most have succeeded. This is great Jeff ! Good you ‘ve got it and it tends to confirm that internal idsc/partition can save the install when USB keys are “failing”.. I have tried everything noting worked. it just show the apple logo and boot into mountain lion. Also i have to say that the script is not working for me i have to manually copy packages, boot.efi and manually edited the plist files to add my board id and supported mac and manually edited the osinstall.mpkg file. This are my macs specs i have followed the steps but is not booting at all. i am using external HDD partition for this, it is bootable. I’m sorry that it does not work for you. I’m not sure it can work on macbook at all. Concerning the script and failures please email me some log of the terminal window or screenshots so I can dig on what ‘s wrong. Most problems usually appears after using the script when trying to install, I’ve had not been reported with suchs problems on such steps of the script. Maybe a localisation stuff, what is your main System language ? Hello i need your help ;( I have a macbook early 2008 so not capable to run mavericks because of old graphic card. I cannot download Mavericks from App store, as you can i magine. I obtained a DVD .dmg Mavericks DVD but with this .dmg i don’t know how to put Mavericks.app in Application folder. If you have a regular email i can send you some screenshot showing my problem. Since i cannot start from “Maverick installation app in Application folder” nothing works ;( I used another method to create the USB key. It appears all goes well but when i boot from the usb key with alt, i get a prohibited sign. Can you help me ? Thank you very much. I can’t tell for sure but I do think macbook won’t run Maverick because of older graphic card. If you wan’t to try anyway just double clic on the dmg you speak of. then choose the installer from there in the settings menus to choose installer. you should choose either search or enter manually the path of the installer. (you normally can drag and drop the installer on the window when prompted to enter manually the path). you’d better go and check on Macrumors about macbook as you may waste time trying to get things working for a computer that will (maybe) never be able to run it. For this the only way would be modified kext and so, and as for now I’ve not worked on those particular pbs. The program did a flawless job of creating the boot USB. Very simple to follow instructions and menus. I appreciate how the program read my board ID and automatically edited the necessary files, inserting the new EFI etc.on my Mac Pro 1,1. Thank you OEM! I did pull my ATI 5770 video card out and put my original video card in so that I could see the boot screen during this process. I should add that I did a clean install on a new SSD drive mounted on a PCI card adapter. After successfully installing Mavericks I removed my Lion OS ATA hard drives and reinstalled the ATA 5770 video card. Unfortunately now I see nothing when I try to boot from the new SSD alone. My next step will be to put the original video card back in and see if there is any message showing up during the boot process. Any suggestions on how to resolve would be much appreciated. I’m not sure I got the exact trouble you have. You have successfully installed Mavericks with the original video card. you have another one (ATA 5770 video card) and then you don’t have video right ? or you jut don’t boot at all ? I’m not the kext trouble expert I’ve got to say. first as you suggested I would boot with the video card you got success with. I’ve read on macrumors for those kind of trouble than some just keep both Cards so in case of trouble they plug the old one. and so I would try to boot with both video cards, plug the screen on the one that works, see what happens, if the other ATA 5770 appears in system profiler. if not then I’m affraid it won’t fit unless you play with kexts. I don’t want to say stupid things and I’ll take a lot at the comments on my site to see if others had succes swith this video card. OEM, I did try booting with the original video card, which allows me to see the boot process. I learned that the SSD drive shows up when I hold down the alt key and I can boot up successfully if I go though that process and select the drive manually. I think this is because apparently the Mac Pro recognizes the PCI mounted SSD as an “external” drive. I tested this by using the installation USB to install Mavericks on a spare clean partition on an existing hard drive in my normal ATA bay. It installed and worked flawlessly. So now I will have to purchase an Icy Dock adapter and install the SSD in the normal ATA drive bay to make it be recognized as an “internal” hard drive. Then it should boot up automatically when designated as the startup disk. I will lose the extra speed of connecting directly to the bus via PCI, but I do not know of any way to make the Mac Pro 1,1 recognize the PCI mounted SSD as an internal HD. Thanks for your excellent work in making the creation of a Mavericks installation tool for the Mac Pro 1,1 so simple and effecive! To clarify the video card issue, when upgrading a Mac Pro 1,1 to Mavericks, it is necessary to upgrade the video card in order for the graphics to work well. Unfortunately the new card, typically an ATA Radeon 5770 does not allow for viewing the boot information, so one cannot manually boot with the new card. So I put the old card back in only for the time necessary to troubleshoot this issue, then I put my new card back in so that Mavericks works well. Thanks again for your help. I really really have to begin to think of compilation of the success and failures reported here ! Really cool you figured it out. I can’t help with PCI SSDs as the MacPro1,1 is at work and I can’t play much with it. I also work everyday on Macpro3,1 so no Tiamo’s boot.efi needed with it. And I really appreciate your congrats. But I have still problems to run the Key. The Scipt tells me at the End, that everything is fine an i can use the SFOTT Key. But the Key only has a size about 23 MB. When i go to the Key and open the installation package there is no Shared support Folder an no Install.dmg and no OSInstal.mpkg in it. So have you any Idea how I can solve this Problem. During the the compiling of the key the Script runs all Processes fine. Also it takes a while to copy the packages to the SFOTT Key. Not sure I understand the 23mb you’re talking about. I’d say that’s the left space but I may be mistaken. Your Key must be an 8 Gig USB key. Damned did I specified this? – I’ve got to check for that. you should only see Applications and the installer. I also didn’t get if you DID boot on the key or not ? I mean, that the SFOTT datas on the Drive only about 23 MB. I use a 500 GB USB HD. When I do a right klick on the Installation folder in it, an chose Information, it say that the data in it only 23 MB. But it should be about 5GB, shouldn’t it? When I try to boot from the SFOTT key, I can choose it anyway. But after choosing the system load for a while an starts then from the normal system HD with Snow Leopard on it, although I have choosed the SFOTT Key for booting. drwxrwxr-t@ 24 Andreas staff 884 6 Mär 00:23 .
drwxrwxrwt@ 7 root admin 238 6 Mär 00:59 .. Sorry. I’ve been blind. The datas were invisible. I thought the data are in the Installation folder, but the data are directly in the SFOTT folder. So I thought the Installation folder should have over 5 GB…. my fault. This could be an issue… I don’t know what but anyway I’d like to know. – Either wipe the key “again” or go to disk utility and add a 8 gig partition to the disc. 1) Avoid the copy of the Packagaes but only the OsInstall.mpkg than needs to be patched. you’ll have a dummy key and it will only take few minutes to make. In the early days of the script, I had a comment about a guy that seemed to have troubles too and whoose language made the Utilities folder named … not Utilities. If it boots and you see the installer (DON4T try to install it would fails – simply reboot on your regular System, and go back in Sfott script – don’t turn the dummy option – it is not by default anyway) and select convert dummy key to real key. If it don’t boot… hmmm we’ll have to dig deeper. Anyone try this on a MacBook Air? I click on the Installer from the USB after it reboots and it starts processing but then I get: “To download and restore OS X, your computer’s eligibility will be verified with Apple.” And then “Could not find installation information for this machine.” What am I missing? Do I need to wipe the Lion install and let it load fresh? It’s a new install anyway since I just replaced crashed HD with SSD. FIRST don’t WIPE OUT your working system never ever do that. UNTIL you know it works ! I’m not sure if mba will work, but if you did get the installer you should be close. I’m quite sute first mba model won’t work, for others, hmmm I just don’t know, I’m not very active on Macrumors lately and di not really follow what Machines did work. you should try an external USB drive first before trying on the internal drive. I would have said that if it did’nt work at all, you wouldn’t have reached the install screen, but I may be wrong. please pardon me as I can’t give you an accurate answer and would most likely tell you stupid things.. I just dont know for mba. First, I forgot to thank you for the SFOTT script in my first comment. It rocks and made prepping the bootable USB with Tiamo’s boot.efi effortless. I’ll keep troubleshooting “could not find installation information for this machine” issue. If I succeed getting Mavericks on early 2008 MBA, I’ll post what I did here. I won’t try a fresh install unless I’ve exhausted other options. But don’t worry if I do wipe the system. There is no data for me to lose yet. I have a new SSD in it with a new Lion install. We’re just trying to recycle what was a broken MBA. So far so good. I’m typing on it now. well you do know what you’re doing.. that’s great. I’ll dig a bit to see if I found any infos on MBAs. This is a very helpful script which replaces a lot of drudgery. As most good scripts do. However, I made a key using a 10.9.2 installer and the latest script. I carefully added my MacBookPro2,2 board ID Mac-42187CB to the key and followed the steps. Boot works great (looks just like booting a hackintosh) but when I try to run the installer I get a modal dialog saying I can’t install mavericks on the machine in question. I am perplexed an di can’t find much on the web to help me. Sorry to hear that, seems I’ll have to do a key with this new Installer to see if I’ve got it working or not. I’ll try to do that this week and I’ll report back here. Are you sure you’ve got the right Board-ID ? I did find a close one : Mac-F42187C8 in the Lion plist. maybe you did a typo…?? don’t really see other reason but I may be wrong. Hi, I have a MacPro 1,1 with an ATI 5770. It is working extremely well but I need to move it onto Mavericks for compatibility with some applications I use. I have read and re-read the information here, and in Mac Rumours, and think I know what should be done but I just wanted to check first, and ask a few questions. I am using all four drive bays on my system. Bay 4 is the boot disk and is an SSD with just the OS and Applications installed. 1. Am I correct in thinking that I create the USB key whilst booted from this drive? 2. To test that everything is working as planned, after I have created the key I intend to replace the boot SSD with a formatted regular drive to do a clean install. 3. Assuming that works, can I replace the SSD again, re-run the installer from the USB key and upgrade the existing 10.7.5? 4. Will it matter that my home directory is not on the same drive as the OS? 5. After all my reading I am still not clear if an ATI5770 will work. Can anyone tell me (I am currently driving two monitors with it). 6. Did I read correctly that the system’s wi-fi will not work after upgrade? What about Bluetooth? 7. I already have the installer for the original Mavericks Installer in my Apps folder, but presumably I need to download from the App Store agin to get 10.9.2. Is that correct? 8. Am I also correct that after installation ‘normal’ software update for Mavericks doesn’t work and we have to go through this process again? 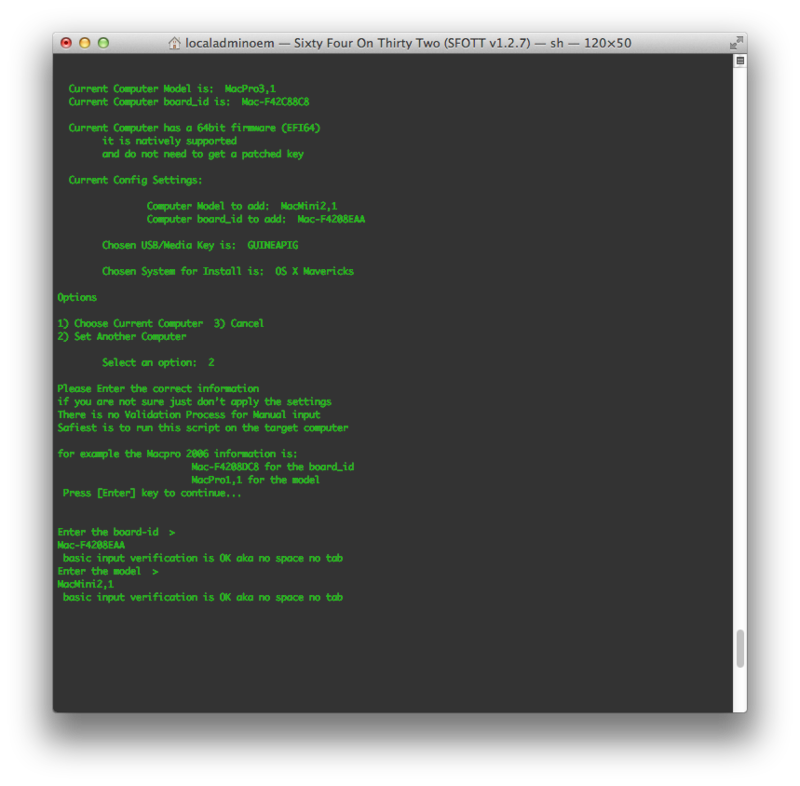 1) Yep… you can run the script from any (Intel) Version System (for now). 2) That’s what I’d do. Never ever test on “real system” such tricks. You could also use an external enclosure. I’ve tested on internal PATA drive below the Optic bay, then moved it out in an enclosure (so I can also test on the Mini). Note that I’ve plugged out ALL internal HDD bays from the Macpro1,1 in my first Tests as I couldn’t afford to ruin the existing 10.7.5 System. ! this is not mandatory but we’re always better safe than sorry. Yes, it should work. I’ve read some have done that way. No, I think I’ve also read it was better to do a Clean install, then use the Assistant @ first launch to get datas moved. I’m not sure I’ve not tested. well a mix of 1) and 2). Do as said on 1) then a first boot use the Assistant to get datas and so. 1) run the script and install on partition A.
before booting in Freshly installed 10.9.x on Partition A) => clone it on partition B. 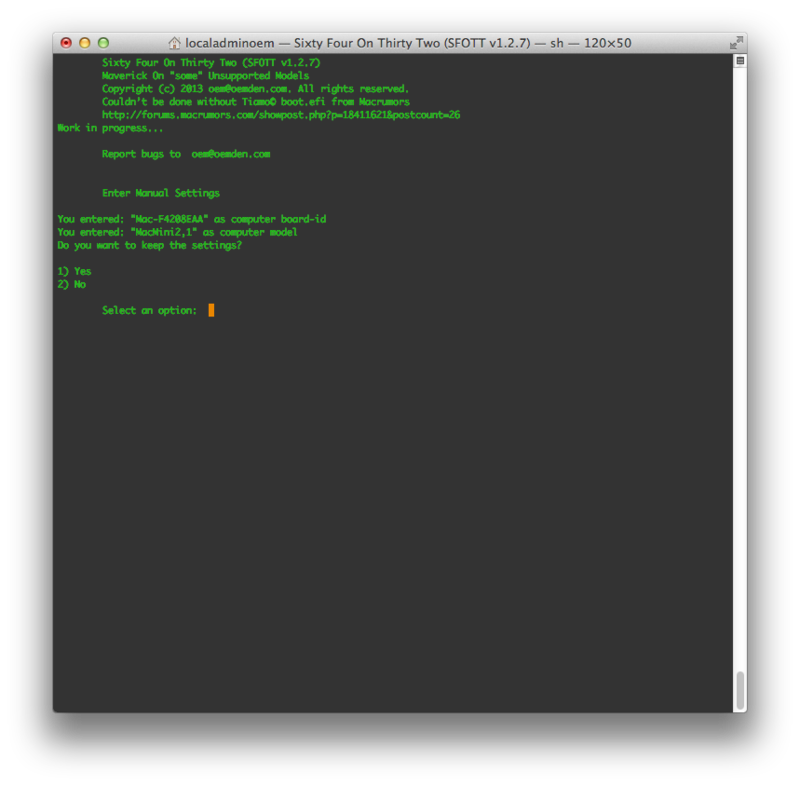 – boot from Partition A), don’t transfer datas and do basic tests. 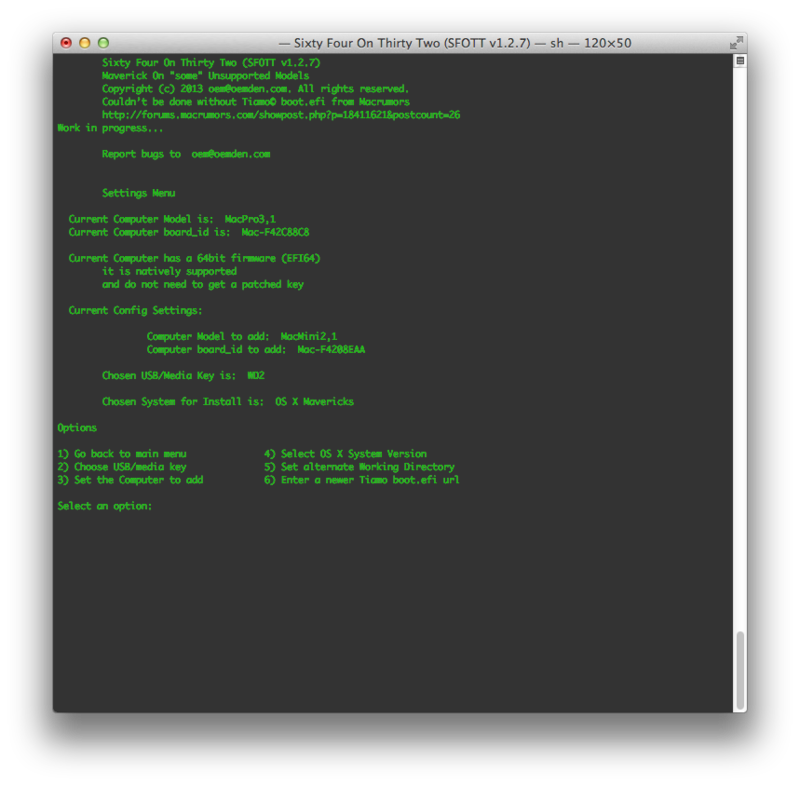 – boot from partition B), and this time, DO transfer datas and again do basic tests and see if all goes nice. Now, you’d be able to decide if you prefer to to do a Fresh Install and transfer datas, or upgrade your SSD directly. Even better in my point of view. But to ease things, you’d better always have an account (either invisible or visible) on the System drive. trust me it is helpful mostly when upgrading and debugging. you can then use that account for basic tests then relog into your regular account. Note : That I think I remember I had to delcare “again” the Correct path of the User once. and I was glad to get the admin account on the system ;) to do so. 5) Damn I so bad on graphic cards ! Yes some have reported it worked, but you won’t have boot info, only when the system will be fully loaded you’ll have info. So, this could be a bit tricky if you don’t have another graphic card at hand for debugging. 6) In my macMini2,1 there’s no wifi. 7) No if you have already an installer you can go on with it.. the you’ll be able to update from the App Store. note that you’ll have to ree-patch the system to get it working but no worries it is OK. see here : http://oemden.com/?p=791 for details. Note taht if you have a qualified mac then just download direclty the 10.9.2 installer to make the key avoiding the hassle of the 10.9.2 update procedure. 8) No, Normal system update runs fine once Mavericks is installed. just go to the Updates tab and install. I’ve had no trouble doing so on the Macpro1,1, that’s also how you’ll do it in step 7. Thanks for the extremely comprehensive set of answers. Rather than try and rush this job today, I think I will make it my project for next weekend. I will let you know how it goes. Again, sincere thanks. Just a quick note. After extensive testing using the method you suggested, I eventually went for an upgrade of my existing 10.7.5. I am pleased to report it went like a dream. All software is working, the wi-fi is fine, my graphics card (ATI 5770) is perfect and reporting its full VRAM and there appears to be nothing untoward. There were a couple of minor permissions issues initially, I think because my home directory is not on the boot disk, but I manually resolved these. Thank you SO SO MUCH for your work. I now have a really fast system WITH the latest OS, rather than a really fast system two versions out of date. I remain puzzled why Apple has locked some of up out of the upgrade process when the hardware is still absolutely capable of taking the OS, but thanks to people like yourself who spend time making these things possible. I note that there is no recovery disk, but presume I can boot off the USB stick if ever I need to get at the utilities? So glad it worked fine. thanks for reporting back here, and thanks for your congrats, always nice. 1) there is no recovery – and I am damn very late on my Recovery utility coding. Note there are utilities around that will help you create one. 2) you are perfectly right, you can indeed use the Key as a recovery Partition alternative – in fact there are slight changes but on most part the Recovery is based on the BaseSystem.dmg from what I’ve seen during my numerous tests. I have an early 2008 MacBook 4,1 (the black one). I tried many ways to install Mavericks without any success. Problem is that the installer won’t boot. I tried with tiamo’s boot.efi, i tried SFOTT, i tried also a hackintosh installation with Unibeast. I tried to boot the installer with Clover, i tried Chimera. I tried with different USB drives and finally tried to copy the installer directly in a partition of a secondary SATA SSD. There was simply no way to get the Mavericks installer to boot. All the devices regularly booted in a Macbook 5,5 unibody (early 2009) that natively supports Mavericks. I’m starting to think i’m missing some kernel flag. Have you any idea that could help me? Sorry for this late reply, have been busy lately. I can’t tell if others may have succeeded with this model. Sadly I am having the same problem with a black 2008 Macbook 4,1. I cannot boot the installer, I always end up back at the installed OS login screen. I have tried both USB and second partition on main HDD to boot the Mavericks installer from. Both with SFOTT and manually patching everything myself using Flat Package Editor. Immediately the system reverts to booting from the installed 10.6 OS X.
Hi Dodino, I might have finally found a solution. Patch your key using SFOTT, but DON’T USE TIAMO EFI. The Macbook4,1 already has 64-bit EFI so doesn’t need the hacked EFI. Also you must delete “/System/Libray/CoreServices/PlatformSupport.plist” from your key – patching this file doesn’t seem to get around the hardware check, but deleting it does. My Black MB4,1 is installing Mavericks 10.9.4 right now. Hopefully it will be successful. I’ve tried to remove the support plist and I didn’t patch with the custom EFI. When I boot, It tells me Mavericks can’t be installed on the computer and asks if I would like to use Time Machine to restore my files. I can’t be much help for those kind of install (yet) I have no such hardware. please try to read the successfull reports page, as If I’m correct one User gave a method that worked for him. I know I have to create an alternative menu/method for such installs, but did not yet as I have no hardware to test it. Patching key with SFOTT. My mavericks version was 10.9.1 at this time. Absolutely I did not use TIAMO EFI, I kept original EFI. The main point is PlatformSupport.plist file. I did not erase PlatformSupport.plist file. I just modified order of SupportedBoardIds and SupportedModelProperties. A9) above F223BEC8, and Model name(MacBook4,1) just above MacBook5,1. Moreover I did the same thing at InstallableMachines.plist file. After this work, I could boot with USB Install Key and install. After installation, however, booting failed, so I rebooted with my USB install key again and executed terminal and I double checked the PlatformSupport.plist file on my installed hard drive. The file was restored, there was no my macbook4,1 information. I modified PlatformSupport.plist file of hard drive again like I did before installation, and reboot. Finally, my macbook 4,1 booted successfully. Update was success as well. Now it is 10.9.5. Xcode 6 also works well. So due to some video card incompatibility issues with my Mac Pro 2,1 I have to build the USB key on an iMac 12,1. However, to summarize it. The USB key is being created and when I try to run the installer on the MP it just sits at the Apple loading window and nothing appears to be happening. I have let it sit there spinning for about 10 minutes. Sorry for the late reply, I had internet trouble. OK, so I’m not sure I get the issue. When you say ” I try to run the installer on the MP” you mean the Mavericks Installer app ? Do you actually boot from the key ? if so, then does “Apple Loading window” means the Grey Apple window from the boot sequence ? I don’t know why many have problems with USB sticks, you may be one of them. – 1st) get a spare disc for this if you can it is always better to test all of this on a dedicated disc, or at least a partition on one internal drive. – plug your MP in target mode on your iMac, if you have a spare disc for the Os Install, then create a partition on it – 8gig will do, at the end of it. So will use the main bigger partition for the Mavericks System, and the last 8 gig for the “Key”. So your MP plugged in on your iMac, you’ll then choose the 8 gig partition in the prefs, go on for the key creation. – Once done, eject your MacPro. shut it down. then start it with alt key pressed, choose the “installer key” and you should be good to go. Be sure to enter the correct informations concerning your MacPro2,1 Model and board-id…. ! thanks for proving us with this great opportunity. I have some issues, though: (I hope I followed all steps correctly.) I’m not sure what to do after rebooting and selecting the usb drive. If I click on the Install OS X Mavericks, I get an error message: “This is not the supported methods of installing the operating system. Please run Install OS X Mavericks.app that you downloaded from the App Store”. meaning when you boot from the key in case of Success you should land on the Installer window but without Finder and Os X “standard” environment. So, if when you “boot” from the Key and you have a Finder then it is not good at all. This is what seems to happen as you state that you do click on the installer, which means you did NOT boot from the Key. In such case, this means that even if you choosed the key at boot it failed and selected first/any System available. when you boot or restart you have to press the option/alt key until you see a grey screen. all available Systems will show up including the USB stick – it should be labeled SFOTT and at least it should have the Sfott icon. Please note that not all unsupported Macs can do the trick, and you did not tell what Mac you’re attempting to use. Please also note, I always insist that you really really really should use a spare / guinea partition/hard drive first to test the installation, and if successful then go on further. In any case you must (should, really really should) have a Backup of your system. You should not attempt this on your “unique” System if that’s the case. That being said (backup, backup, use of spare drive) if you did run the script from the targeted Mac you should be able to boot it from the patched Key. don’t hesitate to comment back if yo uhave still troubles or if you succeeded and givingyour hardware configuration. thanks for your help, although i don’t seem to be able to run it. I’m definitely booting from the SFOTT key. I’ve also tried to use a partition of my HD as key, but I keep ending up with the finder after booting form the key. It’s a macbook4.1 i’m using. Hard for me to get what the problem is, but you have a boot “failure” – aka you try to boot from the key but as it fails you end up in the Finder (your actual System). I’ve read somewhere in MacRumors -I think- that not all macbooks will be able to do the trick even with the installer patched. you should dig a bit on the site. I believe it is a graphic card “issue”. what’s for sure is that somehow patch is quite working as it begins to boot from the “key” but if you end up on Finder, it fails – as you of course have figure out, I know. The only other things besides the graphic video issue, would be a wrong Model board-id info. Did you get the correct Model board-id when entering the settings ? Please note that some have had trouble with getting correct Model board-id on some MacPro1,1 as they get infos that they have a MacPro3,1. one may have found a clue, he has used Mavericks Download Enabler. did you eventually use Mavericks Download Enabler ? I thought I followed your steps perfectly. I pressed restart, and held down the option key. I chose your “OS X Base System” and pressed the arrow underneath it. My computer restarted, the Apple logo came up (which is a great sign since lately all I’ve been getting is that anti symbol) and a few seconds after the Apple logo came up, the computer shut down on itself. I tried again, some issue. Could it be because I’m running 10.5.8 on my computer? (no, not 10.8.5). Also may I mention that I have two hard drives? One is called “Mac HD” and it’s an SSD. The second hard drive is “Old Mac HD” and it’s NOT an SSD. Any help would be greatly appreciated! What Mac are you running ? Have you runned the Steps by Steps or autorun to create the key ? After posting my comment yesterday, I thought 10.5 might be too early of an OS to work. So I installed 10.6.8 just now onto the MacPro1,1 (Mac-F4208DC8). I ran your Script. I chose Autorun, and once the program was complete, it turned the USB drive name from “OS X Base System” into “SFOTT”. So I changed it back to “OS X Base System”. I clicked restart. When I heard the ‘chime’ I held down the option key, and it showed me the options for which drives I could boot up to. The USB drive “OS X Base System” didn’t show up there as an option. It showed up yesterday as an option to boot up to, but not today :( Now I’m trying this other USB drive that I did manually myself without your software and it has mountain lion on it. And I was able to boot up to it. It said installing. Once the installation was complete, the computer restarted, and showed me a big “anti” symbol which went away quickly and then the apple symbol showed up and the computer booted up to 10.6.8, not mountain lion. Then I think I plugged the Mountain Lion usb back in and tried booting from that, and it sat on an “install” inscreen forever, so I forced the computer off since it was clearly stuck thinking and wasnt moving for a really long time. Now my mac monitor wont turn on for some reason!!!! The only way to see the computer now is to thether it (connect it) to an older imac at my office via Target mode. So I’m viewing this computer through an iMac and I ran the Mavericks installer from the desktop, not your boot drive. and it said it installed. When I go to System Prefs->Startup Disk, it says the SSD drive is 10.9.2 and the older hard drive is 10.6.8. So I click the 10.9.2 hard drive as the startup disk. The computer restarts and boots up to 10.6.8 despite my request to boot up the 10.9.2 hard drive. I’ve just restarted, held down the option key, chose the USB Mavericks install drive as the boot up drive, and it just boots up to the old hard drive which is 10.6.8. I accidentally click someone or typed something while your script was booting up and now your script wont open any more. I deleted and reinstalled it. 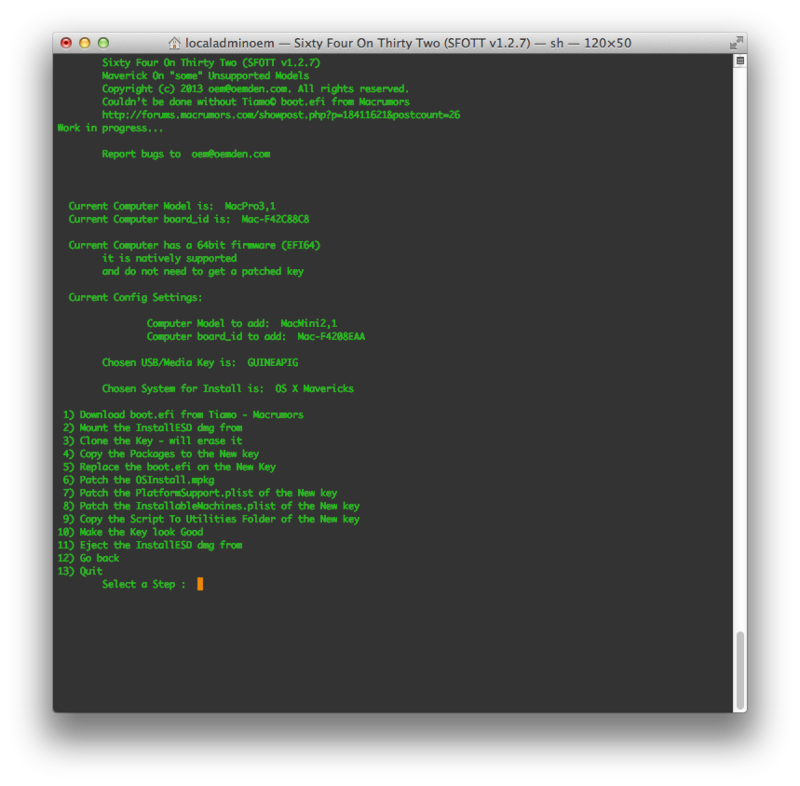 and when I open the script and type my password, nothing happens in terminal now. I’ve spent a week now trying to troubleshoot this computer to get it to mavericks. I came close to some successful results, only to warrant new problems and issues. my boss says spending all this time on it isn’t worth it to get keynote (mavericks version). Has anyone else on this forum been successful at this with a MacPro 1,1 with an SSD as one hard drive and a normal drive as the second hard drive? Will this not work because Mavericks is 64 bit and my computer is 32? (which I thought what your software was for), but now I’m just having way too many issues. bad day? wahooo I have to read all that in depth tomorrow, but you did so much I have to decipher all what you’ve stated/tried. I can assure you that yep many have succeeded in getting Mavericks on a MacPro1,1 – myself for example and with having a key created from a 10.6.8 System. Just a point and I’m not sure it is a big Matter but you’d better not rename the key labeled SFOTT, this is not mandatory but this definitly not what’s causing you troubles. My SFOTT script is aimed to ease the patched installer Key creation (either on USB Stick, external or internal hard drive/partition). What’s making the Mavericks installation possible on some of 32 bit Boards like our MacPro1,1 and 2,1 is the Tiamo’s boot.efi. this is what does the magic. I’ve understood you have “obviously” troubles, indeed. Don’t give up, but please let me read and understand all what you have done. After posting my comment yesterday, I thought 10.5 might be too early of an OS to work. So I installed 10.6.8 just now onto the MacPro1,1 (Mac-F4208DC8). I ran your Script. 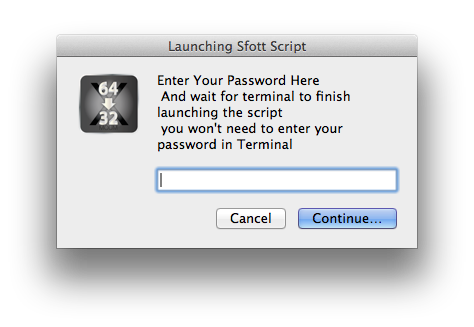 I chose Autorun, and once the program was complete, it turned the USB drive name from “OS X Base System” into “SFOTT”. So I changed it back to “OS X Base System”. I clicked restart. When I heard the ‘chime’ I held down the option key, and it showed me the options for which drives I could boot up to. The USB drive “OS X Base System” didn’t show up there as an option. It showed up yesterday as an option to boot up to, but not today :( Now I’m trying this other USB drive that I did manually myself without your software and it has mountain lion on it. Some have had trouble and had to try 3 times or more to get it boot. I suspect the USB Key power here. I also have had a “bad” USB key that just did not work, althought I was able to create the patched key on it, I could not boot. I choose a brand new Key to create the Sfott again and it worked straight. Note that I also had to plug the Key on the Back once or two as it did not want to show up from the front panel. And I was able to boot up to it. It said installing. Once the installation was complete, the computer restarted, and showed me a big “anti” symbol which went away quickly and then the apple symbol showed up and the computer booted up to 10.6.8, not mountain lion. Ok I’m almost lost here, this is what I understand : you’ve installed Mountain Lion on another USB external enclosure. But is it a Patched Os ? how did you patched it ? 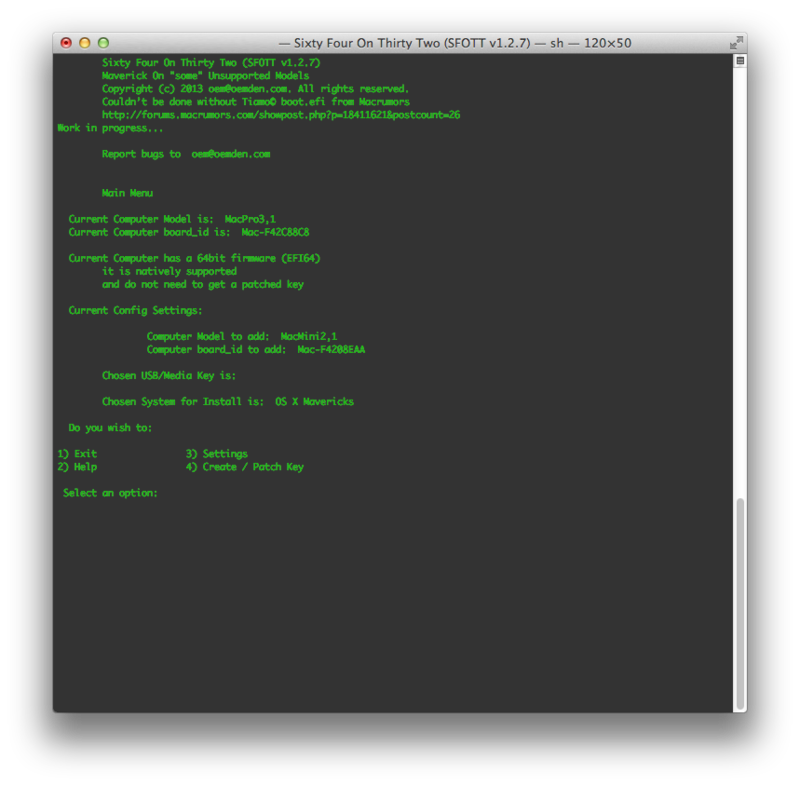 If not patched with correct Model and board-id you will never boot from your Macpro1,1 with Mountain Lion. Then I think I plugged the Mountain Lion usb back in and tried booting from that, and it sat on an “install” inscreen forever, so I forced the computer off since it was clearly stuck thinking and wasnt moving for a really long time. Now my mac monitor wont turn on for some reason!!!! Main reason would be graphic card drivers. or altered files on the filesystem when you shut it down. The only way to see the computer now is to thether it (connect it) to an older imac at my office via Target mode. So I’m viewing this computer through an iMac and I ran the Mavericks installer from the desktop, not your boot drive. and it said it installed. When I go to System Prefs->Startup Disk, it says the SSD drive is 10.9.2 and the older hard drive is 10.6.8. So I click the 10.9.2 hard drive as the startup disk. The computer restarts and boots up to 10.6.8 despite my request to boot up the 10.9.2 hard drive. Here I’m begining to be afraid that you are trying all of that on your production System. If so and it would be too late, note that you have to Back up your system and that best is to use a spare drive first. Abit late bust I always insist on this in my pages and in comments too. Now if you did install Mavericks from an iMac on your target disc MacPro (thethered MacPro) without using the Key it just won’t work for sure. you can boot From it and then install Mavericks FROM it. Launching the installer on the Key from the Cyurrent System (10.6.x for exemple) won’t work at all. Again you must boot from the installer in any case. I’ve just restarted, held down the option key, chose the USB Mavericks install drive as the boot up drive, and it just boots up to the old hard drive which is 10.6.8. This is because, your install is just not correct (not patched) so your Mac will just automatically search for a Correct System to boot from. I accidentally click someone or typed something while your script was booting up and now your script wont open any more. I deleted and reinstalled it. 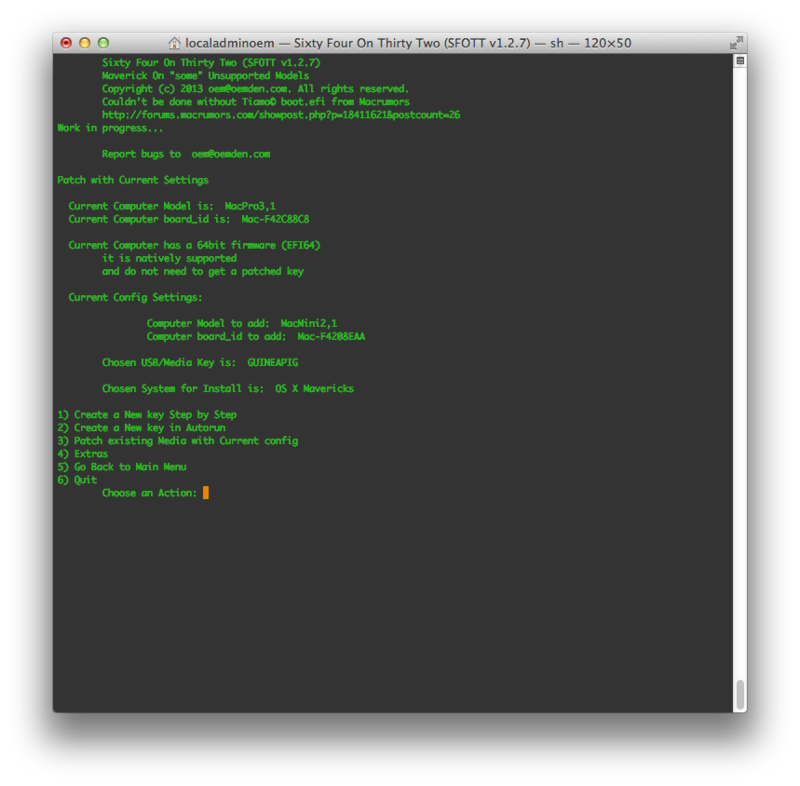 and when I open the script and type my password, nothing happens in terminal now. I’ve spent a week now trying to troubleshoot this computer to get it to mavericks. I came close to some successful results, only to warrant new problems and issues. Ok, so this is a first…. I don’t see what could have caused this behavior. – Go in your User’s Library => Preferences and find the com.oemden.sfott.plist file. – GO in /Applications/Utilities => find the Sfott directory and trash it too. nothing else ! reinstall the Sfott Script/launcher from the dmg. my boss says spending all this time on it isn’t worth it to get keynote (mavericks version). Has anyone else on this forum been successful at this with a MacPro 1,1 with an SSD as one hard drive and a normal drive as the second hard drive? Will this not work because Mavericks is 64 bit and my computer is 32? (which I thought what your software was for), but now I’m just having way too many issues. bad day? I understand your boss too. for sure. I’m still a bit confused on all of what you did. from what I’ve understood. 1- Remove production System’s disc – in case it’s not too late now. 2a– a small one (8 gig) – name it “Installer” for example – it will be used to install the Patched Key instead of using a USB key. 3- Install SnowLeopard on MPSL partition. Run all Updates available and be sure to be in 10.6.8 so you have AppStore. 3a — Now boot on MPSL, 10.6.8 launch the AppStore and download Mavericks. 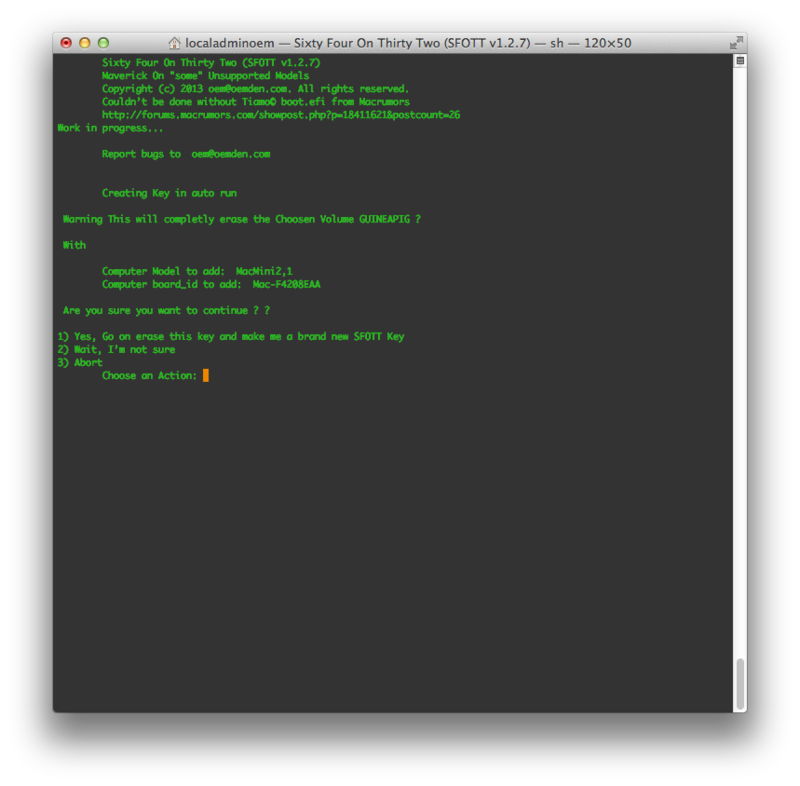 3c — Install SFOTT from the dmg on your MPSL System. Run it. —- Choose the 8Gig partition “Installer” as a Target for the Key. —- Choose Mavericks, then choose the Installer’s Location. 4- You Now should have a SFOTT drive on your Desktop. 5- Reboot hold the option-alt Key and you should have the SFOTT Key appear. 6- If yes boot from it and you should be good to go. 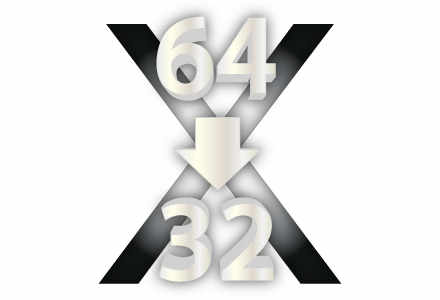 to go faster and avoid lost of time, in the extra menu of the script, choose enable DUMMY KEY. That way you’ll have a Sfott Key but without any Packages. Meaning you’ll reach the Install screen but DON’t TRY to INstall !! It is only to verify all is fine. If you do reach the install screen and have no “messages stating you can’t install on this computer” then we can assume the key works fine. From the Apple up left Menu, choose reboot. and reboot on 10.6.8 MPSL partition. Relaunch the script and in the Patch Menu choose convert dummy key to real key. You then will have a correct Sfott Key and be able to install Mavericks. reboot hold down the option/alt key, choose the Sfott adn there you go. I hope it is more “clear”. Again, Many many have succeeded either with my script or by patching on their own an installer or Existing System. MacPro1,1 and 2,1 are the easiest to install Mavericks on. you may have to consider getting a Video Graphic Card compatible. as you may experience laggy video if you stick to the original shipped one. but that’s a good investment that worth it, when Mavericks is up and running. Thether it on your iMac. install Mavericks as you already did. then DON’t eject the drive and DON’t Boot it yet. Launch the Sfott script, and this time choose Patch Existing System. this will patch the system and place the boot.efi on it. this is the method used to get 10.9.2 back up and running when updated from 10.9 – 10.9.1. That was a hell of a comment…. and really hope you’ll be able to go with all this. But there is no reason that you can’t get Mavericks as all others did. My question is what i must do after a reboot i must hold the alt button than i choose my Usb (name is sfott) than i click on the installer and it comes a error that he could not install it on my mac. What i must do.. 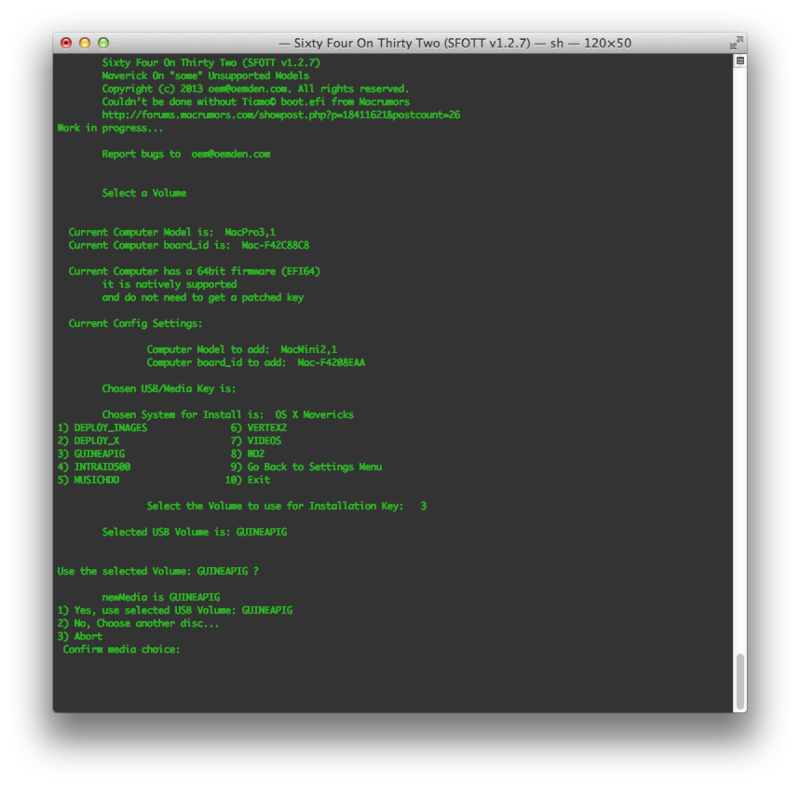 Please in slow and understanding steps… :( i doesnt know what the boot.efi is. if you have an error then Patch is not correct for the target computer. on What computer do you try to install that ? I know it is not supported ;) that’s why you’re here and try to use the SFOTT script/key to get Tiamo’s boot.efi on your Computer. I’ve compared the MacMini2,1 and your macbook3,1. you have a chance to go on but you’ll have to dig a bit. the main issue would be graphic card. As I’ve succeeded on the Mini you could have a chance. but from what I’ve read on Macrumors most old macbook won’t go. Again if the Mac mini did it you could try. How (on what computer) did you runned the script to make the Key ?